For decades, communities have relied on Federal and State laws to ensure protection of a clean environment. And for decades, while achieving some important successes in environmental protection, overall the health of our environment for present and future generations has continued to degrade from a growing number of sources. The truth is, our laws are designed to accommodate pollution as much as, perhaps even more than, to prevent it. As a result people feel powerless when it comes to preserving the quality of their water, air, public parks, and natural spaces. Environmental Justice communities find themselves particularly hard hit; while there is increasingly good rhetoric when it comes to considering environmental justice issues regarding environmental decision making, the proof is in the pudding; communities of color, low income communities, and communities with high immigrant populations continue to be disproportionately targeted for placement and expansion of polluting industrial operations. But there is a solution for achieving better, and much needed, protection of our environment: bypass the laws and turn to the ultimate authority—our state and federal constitutions. 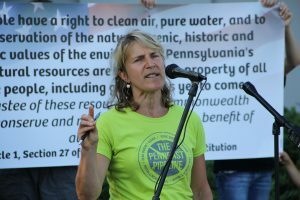 In 2013, Maya van Rossum and her team won a watershed legal victory that not only protected Pennsylvania communities from ruthless frackers, but breathed legal life into the constitutional right of people in the state to a clean and healthy environment. Following this victory, van Rossum inaugurated the Green Amendment movement, dedicated to empowering every American community to mobilize for constitutional change. We all have the right to pure water, clean air, and a healthy environment. This talk will focus on how to truly secure that right for our own sake and that of future generations. MAREA is so pleased to have Maya van Rossum as our speaker on Tuesday, June 25 , at 7:00 at TEKPark (9999 Hamilton Boulevard, Breinigsville, PA 18031, between Kutztown and Allentown). 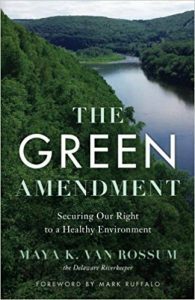 Maya’s book, The Green Amendment: Securing Our Right to a Healthy Environment, will be available for purchase at the meeting, or you can buy in advance here, https://delaware-riverkeeper-network-river-shop.myshopify.com/products/the-green-amendment-securing-our-right-to-a-healthy-environment. MAREA meetings are free and open to the public. All are invited! After the meeting, please plan to stick around and chat with friends old and new. Light snacks will be served. Hope to see you there! Maya K. van Rossum is the Delaware Riverkeeper and leader for the Delaware Riverkeeper Network. The Delaware Riverkeeper Network works throughout the four states of the Delaware River watershed (NY, NJ, PA & DE) and at the national level using advocacy, science and litigation. van Rossum, the original organizer and petition of the Green Amendment movement, is skilled as an environmental attorney, strategist, community organizer, facilitator, coalition builder and manager, has led DRN for over 23 years. Maya was appointed to NJ Governor Murphy’s transition committee on environment and energy, was named One Of The “10 Most Influential People of 2015” When It Comes to Energy Issues by SNL Energy, and has testified, by invitation, twice before U.S. Congressional committees. She has also served as director of the Environmental Law Clinic at Temple’s Beasley School of Law since 2002 when she founded the clinic. She is the author of a book titled, The Green Amendment: Securing Our Right to a Healthy Environment, which was selected as the 2018 Living Now Evergreen Awards GOLD Winner in the Nature Conservation category. She is currently seeking to inspire and secure constitutional protection for environmental rights across the nation. For more about PA’s Green Amendment, watch excellent video from StateImpact PA, Generations Yet to Come.